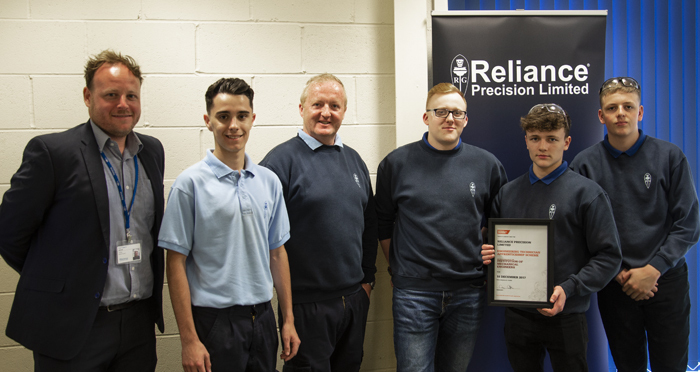 Reliance are delighted to learn their Engineering Apprenticeship Scheme has received re-accreditation from the Institution of Mechanical Engineers (IMechE). The IMechE is an independent, professional association representing mechanical engineers and the engineering profession around the world. Its key objectives are to encourage the development of engineers’ skills and knowledge, and promote engineering innovation. Working with many of the world’s leading businesses, the IMechE deliver a variety of services to support organisations wanting to ensure their workforce is trained to the highest standards. One such service is the Approved EngTech Apprenticeship Scheme. This scheme benchmarks the quality of an engineering apprenticeship programme, with a set criteria and level of achievement an organisation has to meet. Reliance’s Engineering Apprenticeship Scheme, which has been running for over 60 years and is designed specifically to support young engineers starting their careers, has been endorsed by the IMechE for the last 3 years. As an Accredited Apprenticeship Scheme, Reliance’s apprentices receive additional support from the IMechE. Affiliate members at the beginning of their apprenticeship get access to the largest engineering library in the world to help with research projects and dissertations. As they near the end of their apprenticeship scheme they can apply for professional registration as an Engineering Technician (EngTech) which provides independent verification of their skills and experience in the same way that Chartered Engineer does for more senior engineers.